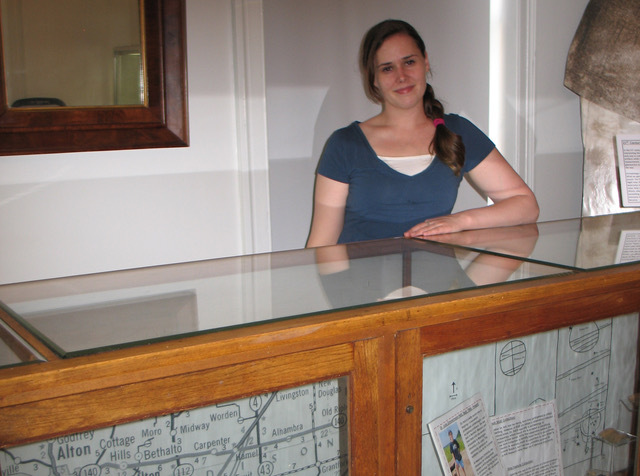 Ms. Knicley, student curator of the “Archaeology of Madison County” exhibit at the Madison County Historical Museum, posing with the exhibit in 2016. This online exhibition series is a virtual version of a 2016 exhibit in the Madison County Historical Museum that was curated by Maudie Knicley, under the advisement of her professor Dr. Cory Willmott at Southern Illinois University Edwardsville in conjunction with the Madison County Historical Museum and Archival Library, as Ms. Knicley’s senior project. Long before archaeology was a science and museums were assembled to display humanity’s treasures, the only way artifacts were available to enjoy was through collecting them for your own collection. Collecting was a pastime of many wealthy, aristocratic, educated men who would buy artifacts from many different types of vendors to then proudly display in their personal cabinets of curiosities. As time went on this practice changed, museums were created, excavations became standardized, and humanity’s treasures and histories were put into context to better understand the people and cultures before our present day. It was a long path, and it is still transitioning, but that story can be seen here through the collections and stories of these three Madison County citizens.